The primary message for this year is to ‘act on mouth health’. This means taking action to give yourself (and your family) the best mouth health you can. Oral diseases, such as tooth decay and gum disease, are widespread and preventable. Through proper self-care and regular dental check-ups good oral health can been achieved. When combined with managing risk factors general health can be secured. It’s never too early or too late to start looking after your oral health. Just like other major diseases, prevention, early detection and treatment are key to ensuring the best outcomes. 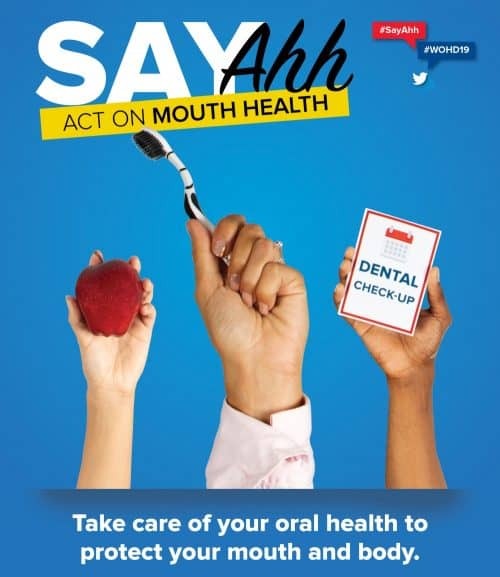 You can ‘Act on Mouth Health’ by adopting good oral hygiene habits; eating a healthy diet, particularly one low in sugar; quitting tobacco use; and avoiding excessive alcohol consumption. Oral diseases and tooth loss impact both children and adults. They are not an unavoidable consequences of population ageing. According to studies by the World Health Organisation, globally, between 60-90% of school aged children have tooth decay. Gum disease and untreated tooth decay in baby teeth are among the top 10 most preventable of all health conditions for children. When children have such a poor start to their oral health it can only lead to problems in adulthood. The dentists and hygienists at Canberra Dental Care play a key role in providing information and guidance on how to prevent, manage and treat oral diseases. They can also provide information about the benefits to your general health and well-being. It is recommended that children start seeing a dentist once their first teeth appear. By creating an early and positive experience of the dentist, children are in a strong position to have good oral health as an adult. World Oral Health Day, taking place on 20 March, is the largest global awareness campaign on oral diseases and an opportunity for all stakeholders to ‘Act on Mouth Health’ and make a commitment to oral health. Safeguarding oral health can help ensure people have good quality of life into old age. Make today the day you take action and make an appointment!